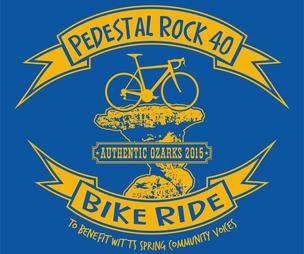 Second annual: hilly ride of 20 or 40 miles to showcase the scenic Ozark National Forest. This year, there is also a 10 mile "primer" road ride and a gravel grinder option. The long ride turns around at Pedestal Rock area. Free camping and showers and the Mason's Lodge has an available spaghetti dinner that Friday night. Ride leaves from W.S. Community Center, Hwy. 377 at 16.